Looking for the best gift ideas for dogs this holiday season? You’re in the right place! Here at Pet Factory, we’re all about dogs. Check out the Gift Buying Tips below before you head out to the stores or shop online. 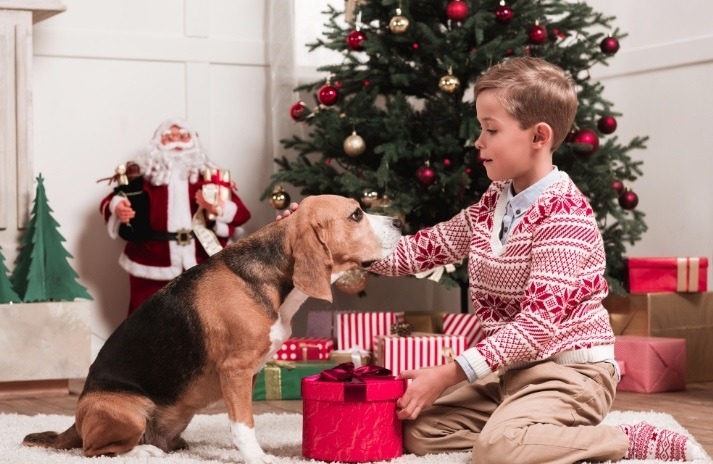 You’ll be well prepared to evaluate the many dog gift options out there for Christmas. Then see our Ten Top Gift Ideas for Dogs for shopping inspiration. 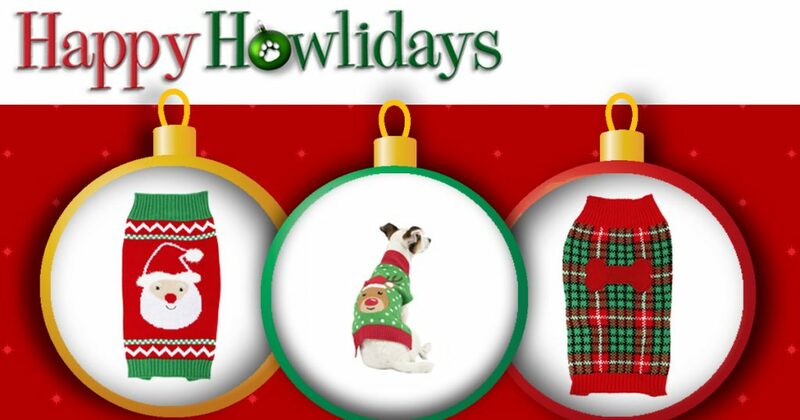 Add these pawsome gifts to your Christmas list for a really special and happy howlidays! Look for pet products that are safe and durable. Safety is Number One! Durable products will be safer and more cost-effective in the long run. Committed pet parents know the value of quality. Look for quality gifts that keep on giving throughout the year. Purchase pet products that are delicious. Your dog deserves a tasty treat this holiday season. Tuck a few beefhide chews into their Christmas stocking. No Christmas morning is complete without a thoughtful gift of dog treats! Look for pet gifts that are fun. Toys designed for retrieving, tugging, and snuggling belong under every pup’s Christmas tree. 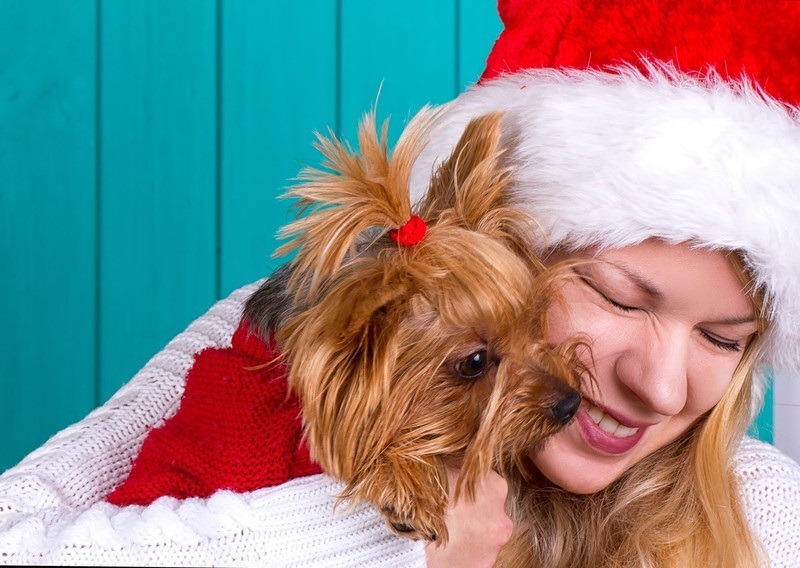 Santa says “Play with your pup!” – There’s no better way to build a lasting bond and demonstrate your love. Purchase pet products that are healthful. Be conscious of your dog’s health, especially during this busy season. Keep your pup in tip-top shape with treats that keep their teeth clean, help to manage stress, and don’t add excess weight. Seek out toys that encourage physical activity. It’s the holiday season! Treat your pup to something really delicious. Pet Factory beefhide treats are available in all their favorite flavors – beef, chicken, and seasonal favorites. Our delicious, long-lasting chews come in fun shapes and a range of sizes to suit every dog. Look for tasty rolls, bones, chips, and Christmas favorites online and at a retail outlet near you. Teach your dog a new trick! Treats and toys can be powerful motivators. Play a game of fetch or catch with quality toys made with your dog in mind. Tennis toys combine the benefits of a traditional tennis ball with an exciting squeaker inside. Pet Factory rugged toys come in a new spiked shape for even more training fun. When you’re out and about with your best friend, bring along some Pet Factory beefhide treats to keep them on track. The holidays can be busy and chaotic! You know how worn-out you can feel after a long day of shopping, gift wrapping and special events. Your pup may be feeling overwhelmed and anxious too. Give them a satisfying, long-lasting Pet Factory beefhide chew for a soothing break in the action. Chews can provide a much-needed safe outlet for your dog and they are 99.2% digestible. There’s nothing more important to your pup than their relationship with you! Build a strong bond with your pup and show them how much you love them by spending quality time together. Play together, teach them something new, and enjoy a snuggle on the couch – it’s all about building that special relationship. 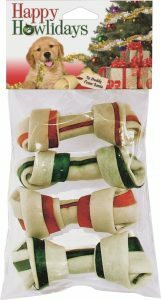 Your furry friend will appreciate Christmas gifts that help to grow your bond, including retrieval toys, rope and tug toys, and beefhide treats. Keep it festive! Christmas comes only once a year, so celebrate by giving Christmas themed gifts. Festive and cheerful gifts will be remembered long after the holidays are past. Thoughtful Pet Factory holiday gifts will be their favorites. 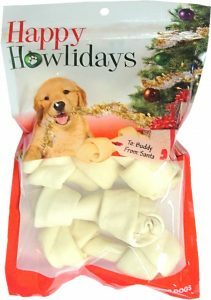 Choose from holiday-themed beefhide chews and toys festively packaged for Christmas gift giving. Good things come in small packages! Look for small items that fit in their Christmas stocking for a fun surprise. 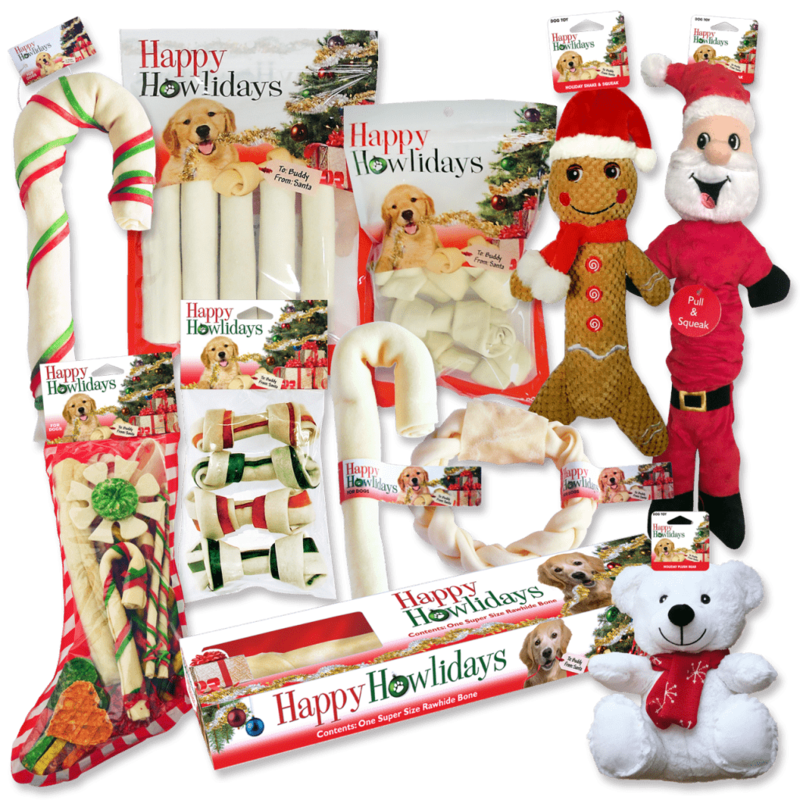 Share the love with Pet Factory Happy Howlidays packaged toys and treats. Beefhide treats in red and green, candy canes, ornaments, and wreaths are all available during the holidays. ‘Tis the season for treats! It’s easy to get your dog’s diet off-track this time of year. Stick with all-natural treats for a satisfying and healthful holiday season. Pet Factory natural beefhide treats fit the bill. They are also 99.2% digestible, keep your dog’s teeth clean, and provide the stress relief that’s in short supply this time of year. Does your dog work hard? Whether they’re a service assistance dog, a working dog, or a companion dog, they deserve a cozy place to lay their head at the end of the day. Give them a gift of a comfy new dog bed or mat, available for both indoor and outdoor use. A wide selection of dog beds can be found at these national retailers. Super cute plush pals are the perfect gift ideas for dogs in your life. Instagram-ready Logical Pet premium plush toys make family holiday photos a snap. Choose from traditional favorite characters like Santa and the Gingerbread Man. Soft and durable for a satisfying cuddle, our Teddy Bears sport a bright and cheerful red scarf. Searching for just the right gift for all the pups on your Christmas list can be tough. In addition, the holiday season can be busy and hectic. Make it easy on yourself with quality Pet Factory gifts, festively prepackaged and labeled for Christmas giving. Look for more gift ideas for dogs and additional Pet Factory products online or at a pet retailer near you.